There’s Mother’s Day, Father’s Day and Grandparent’s Day, National Anything Awareness Day and believe it or not there is even a “National Make Up Your Mind Day” and the “Designated Hitter Rule Anniversary Day”. Thanks to marketing efforts from companies like Hallmark Cards, we have a day for just about everything… including “National Doughnut Day”. I don’t have a problem with anyone naming a day for anything, but I just heard of another “Day” that (IMHO) is worthy of greater recognition. The state of Michigan has designated the last Sunday in June as “Historical Log Cabin Day“. Michigan is the only U.S. state that has an annual state-wide log cabin festival. Log Cabin Day was established in 1987 and is a celebration of Michigan’s pioneer history. They have over 90 log cabins registered ranging from Union Pier near the Indiana border to Lake Linden in the Keweenaw Peninsula. 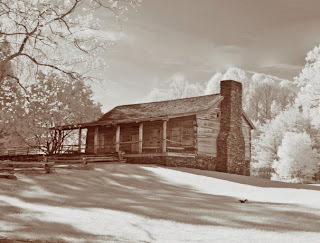 Log cabins played an important role in the development of this entire country and honoring that memory presents a way to keep that pioneer spirit alive in ourselves – and teach it to our children. If you really want to teach a young person what it was like to carve a home out of the wilderness, give them an axe and have them chop down one tree. Discovering how difficult that simple act is (without a chainsaw) will open anyone’s eyes as to what it took to build such a shelter with rudimentary tools. Then of course, the limbs of the tree need to be trimmed, bark peeled, notches cut and don’t forget the effort required to move these logs around and stack them one upon another. Whew! I am digressing here, but we don’t usually consider these significant details when we think of such things as a log cabin from the 1800s. The people who left the cities in the east, searching for a place to make a home in the west were just average folks. These were typically not hardened “mountain men” experienced in the ways of the wild; they were common folks like you and I and the neighbors next door. Honoring the efforts and courage of these early pioneers is worthy of a day of celebration. Way to go, Michigan! Log Cabin Day is observed yearly in Michigan. The celebration consists of a program, log cabin visits, displays, arts and crafts, activities and refreshments and examples of the art of log cabin building can be seen at Historic Mill Creek, Fort Michilimackinac and Fort Mackinac on Mackinac Island. Log Cabin Directory (Michigan) if you want to learn more about how log homes are constructed today in Michigan, talk to some of these modern craftsmen.